We commonly treat low back pain, mid-back back pain, neck pain, morning back pain, joint pain in the arms and legs, and headaches using spinal manipulative therapy (aka Chiropractic Therapy). But our approach differs from other Chiropractors you may have visited. Why wait? Click to call (918) 236-8597 to get lasting relief now. To help end your pain, we adapt our chiropractic care and procedures to your specific needs. 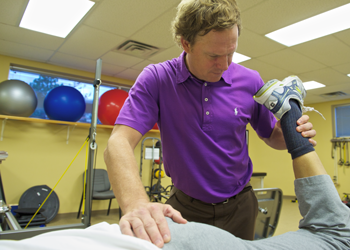 Our goal: reduce any post-adjustment soreness while maximizing pain relief and improved joint function. Most patients report immediate changes to their symptoms following an adjustment, and our results are outstanding: patients “graduate” from our care to a pain-free self-care status. You don’t have to live with back pain any longer. Chiropractic adjustments on the spine reduce discomfort such as morning pain and increase joint mobility and function, as proven by our patient results and a wealth of scientific evidence. In addition to spinal adjustments, we typically combine chiropractic care with exercise and physical therapy to speed up your recovery and improve overall results. Our primary goal of treatment is reducing symptoms as quickly as possible while reducing the chance of recurrence. Many of our patients have already tried chiropractic therapy, physical therapy, yoga, etc. elsewhere and haven’t found relief. But, they find relief from their back pain with us. Their 5-star reviews tell the story. Let us help you the same way we’ve helped them and thousands like them. Need help now? Click to call (918) 236-8597. We’ll find a way to get you in today. Or, fill out this form and we’ll contact you.